This hour we're focusing on the history of civil rights in Maryland with Fraser Smith, author of Here Lies Jim Crow: Civil Rights in Maryland. Fraser is also the author of a weekly column in the Baltimore Sun and the senior news analyst for public radio station WYPR. First, we'll check in with Mike Tidwell, founder and executive director of the Chesapeake Climate Action Network, an environmental advocacy organization. Mike and another member of CCAN recently learned that the Maryland State Police had listed them as terrorists and were spying on them, along with over 50 other peaceful activists around the state. 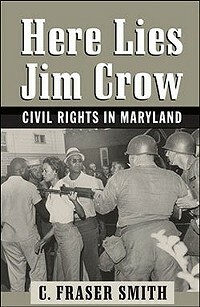 This hour we’re focusing on the history of civil rights in Maryland with Fraser Smith, author of Here Lies Jim Crow: Civil Rights in Maryland. Fraser is also the author of a weekly column in the Baltimore Sun and the senior news analyst for public radio station WYPR. First, we’ll check in with Mike Tidwell, founder and executive director of the Chesapeake Climate Action Network, an environmental advocacy organization. Mike and another member of CCAN recently learned that the Maryland State Police had listed them as terrorists and were spying on them, along with over 50 other peaceful activists around the state. Thanks for this important show. As a lawyer, I am truly shocked at the “fix” that the Maryland State Police proposes for their surveilance. It’s a scary thing when the power structure says to keep your lawyer away. So glad to have you back on the air. We need you.